A few days ago I passed by a shop in Barcelona that caught my attention and when I took a picture with the phone, the person working there told me, “if you put it up on Instagram, do not use any of those old school filters please”. Old school filters. This is one of the secrets (or non secrets) that explain Instagram’s popularity: when we manipulate a photo taken in 2014 in order to make it look like it is from the 80s, we (apparently) give it the time and the perspective it lacks. Here is how we create, at a greater or lesser extent, in real time, our own legend. Now, what if a photo taken in 2014 has a texture and an identical appearance to the first snapshots that were taken during the XIXth Century? 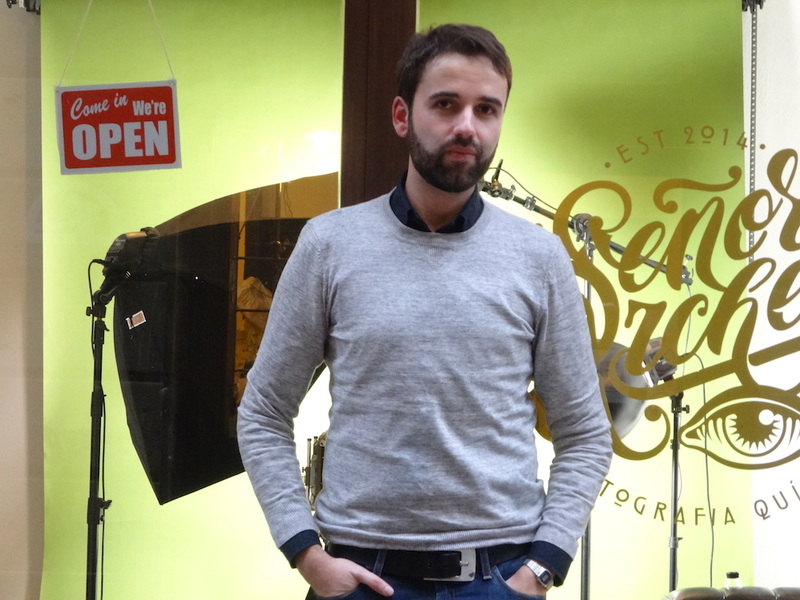 I Visit photographer Alberto Gamazo (Gijón, 1981), owner of the newly opened ‘Señor Archer’: an establishment located on the Calle de la Paloma, in the Raval. 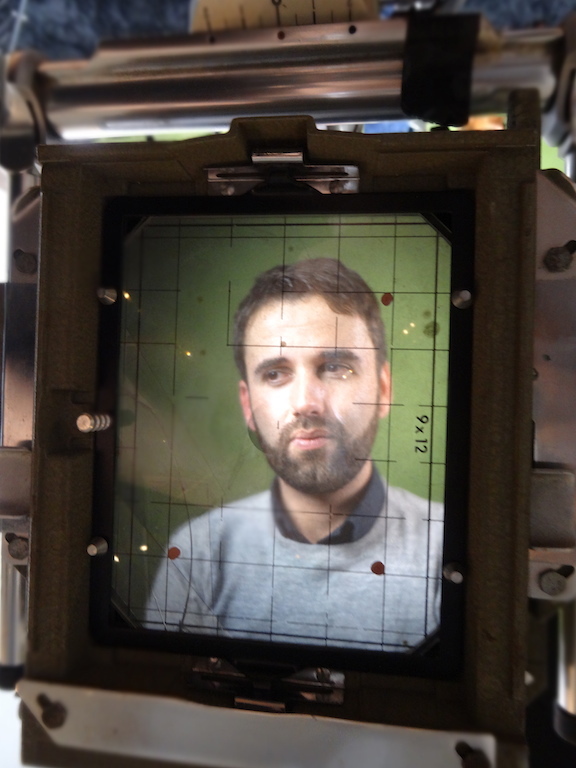 His customers can be photographed using the tintype technique, in the same way that some of our ancestors –those who had that opportunity- were portrayed. It would be too risky adventuring that the fact of having your picture taken in the XIXth century style, as far as the appearance of the final result is concerned, will contribute in creating our own history. However, what is clear is that this experience brings you closer to your great great grandparents and that, at least for me, that was very emotional. On the other hand, it is possible that the outcome of this session ends up confusing, in a few decades, your own descendants: quite an amusing idea. The pursuit of perfection in this environment is not paramount; in fact we embrace imperfection as long as it is aesthetic and not the product of laziness or sloppiness. Those who work with this sort of techniques, accept that there are things you cannot control, the bases must always be stable, but we must also leave room for surprises. This must be one of the most attractive parts of the process. Yes. Another of the magic things of photography is that it is an art influenced by everything around you: the movies you watch, you hear speeches, etc. Each photographer has developed a very personal glance, a fruit of technique and practice, but there is also something innate: if you ask 100 photographers to take the same photo, you’ll end up with 100 different ones. That fascinates me. You came to Barcelona three years ago, what brought you here? I came here with my girlfriend who is a researcher and we moved to Barcelona because it is a research epicentre at a European level. But, well, that was the excuse; I would had finished moving here otherwise. The crisis is hard for everyone, but it is less noticeable in large cities, especially if you are in the photography field where you always require dynamism around. How about the dynamism in the Calle de la Paloma? It is very good. The type of project I’ve started (these premises were inaugurated two months ago) requires being on the street, close to the people. 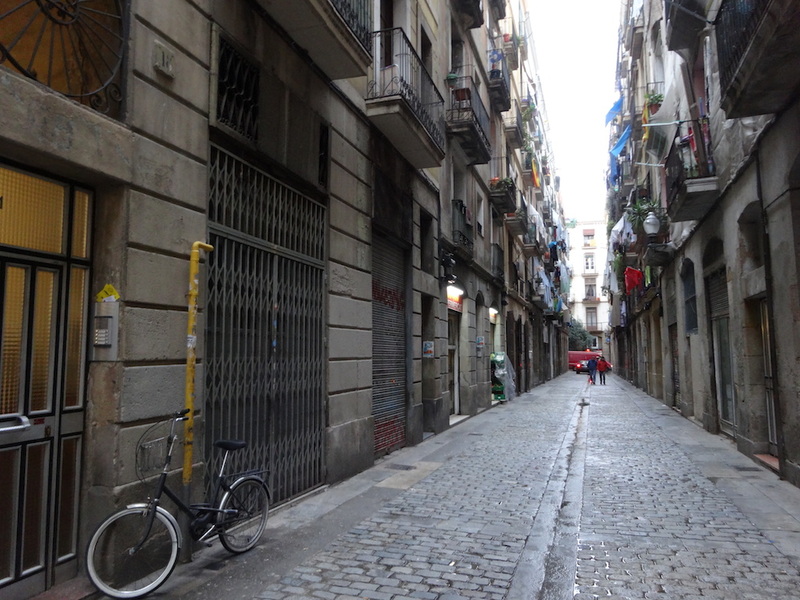 For me, the Raval is a bastion of resistance against the post-Olympic Barcelona that is everywhere. 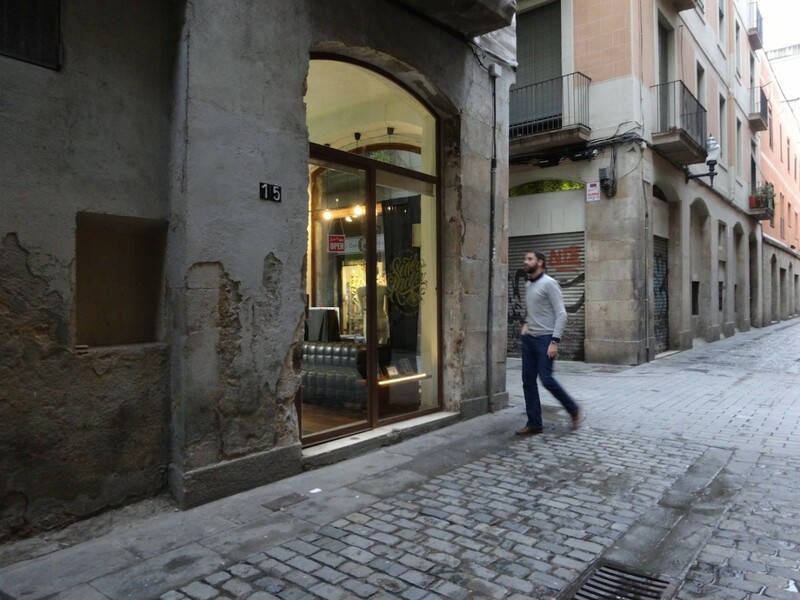 Within the gentrification process that all Ciutat Vella (the old area) is living, I really like the fact that here there are still remains of what is most authentic part. The Raval might also get gentrified, in fact it is already in its way to do so and I cannot deny that this may end up benefiting me. However and for now, I enjoy knowing that this might be one of those neighbourhoods in Barcelona that resembles its original era the most. And this connects with the spirit of Señor Archer. Exactly. Although I always say that I do not want to become a theme park with decorated trees where tourists come to get a portrait taken in Gaudí costumes. If someone wants to do that, so be it. But I do not want to focus in this sort of thing because here, the tradition and the present are very connected, but we must not forget the present! My glance is contemporary and so is the attitude towards being portrayed by the costumers, it could not be otherwise. A century and a half ago it was a big event to have your picture taken, now it has become very ordinary. Another reason why I moved to the Raval is because here I found the perfect location: these high ceilings allowed me to install lights and a loft with room for my office, my records, etc. And, most important of all: the laboratory space with a sink that I think it might be original. I like people to be there with when I develop their pictures, especially when their image appears on the board. I corroborate that it is a unique experience. What made you become so interested the tintype technique? It has always interested me. But, when I came to Barcelona, I started working a lot, first for Jot Down magazine and then other media too. I was very lucky. But while working so hard, I realized that after a session of where you have taken around 500 photos, perhaps only 2 or 3 are published and the other ones get filed forever. Parallely to this, my attraction for tintype grew as a reaction to the speed of the digital format where you take 10 pictures per second. 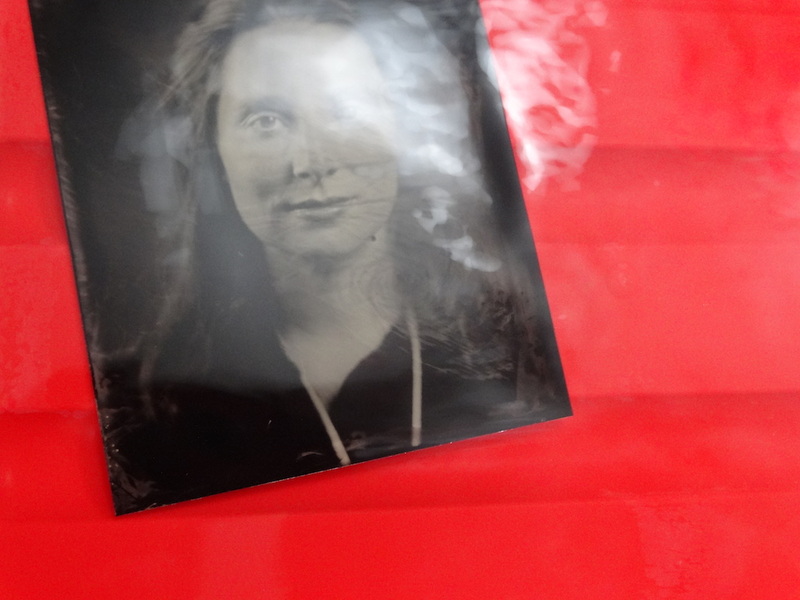 With the tintype you need a minimum of 10 minutes for a single photo. This concept generates much interest even around people who are not normally interested in the world of image. This is a business, but also a meeting point between different people or photographers who want to discover a different way of creating images than the one used by most people today. It is also a return to the origins of photography. The chemicals that are used to create each photo are based on recipes from 150 years ago, there is not much room for innovation, but it’s nice being yourself who mixes the products and, from there, you can always give you your personal touch both in the mix and the process. Ironically, the limits of this technique are also liberating. One last question Alberto, who is Señor Archer? Hace unos días pasé por una tienda de Barcelona que me llamó la atención y al sacar una foto con el móvil, el dependiente me comentó: “si la subes en Instagram no uses ninguno de esos filtros viejunos, por favor”. Filtros viejunos. Este es uno de los secretos que hacen que Instagram se haya popularizado tanto: cuando manipulamos una foto tomada en 2014 para que parezca de los años 80, le entregamos (en apariencia) el tiempo y la perspectiva de la que carecen. Así es cómo en mayor o menor medida creamos, a tiempo real, nuestra propia leyenda. Pero ¿qué ocurre si una foto tomada en el 2014 tiene una textura y una apariencia idéntica a las primeras instantáneas que se sacaron durante el XIX? Visito al fotógrafo Alberto Gamazo (Gijón, 1981), propietario del recién inaugurado ‘Señor Archer’: un establecimiento situado en la Calle de la Paloma, en el Raval. Sus clientes pueden retratarse mediante el uso de la técnica del colodión, la misma con la que se retrataran algunos de nuestros antepasados –los que tuvieran esa oportunidad. Sería demasiado aventurado imaginar que el hecho de retroceder más de un siglo en cuanto al aspecto de nuestros retratos se refiere, va a ayudar a crear nuestra historia, pero lo que sí que está claro es que la experiencia nos acerca a nuestros bis-bis abuelos y eso, al menos para mi, resultó muy emocional. Por otro lado, también es posible que el resultado de esta sesión llegue a confundir, algún día, a nuestros descendientes. Esa idea no deja de ser divertida. La búsqueda de la perfección en este medio no es lo primordial, de hecho abrazamos la imperfección siempre que esta sea estética y no el producto de la desidia o de la dejadez. Los que nos dedicamos a esto aceptamos que hay cosas que no puedes controlar, las bases siempre son estables, pero también debemos dejar espacio para el azar y la sorpresa. Esto debe ser una de las partes más atractivas del proceso. Sí. Otra de las magias de la fotografía es que está influida por todo lo que te rodea: las películas que ves, los discursos que escuchas. Cada fotógrafo acaba desarrollando una mirada muy personal fruto de la técnica y de la práctica, pero también de algo innato: si pides a 100 fotógrafos que te hagan la misma foto, tendrás 100 fotos distintas. Eso me fascina. Llegaste a Barcelona hace tres años, ¿qué te trajo por aquí? Vine aquí con mi novia que es investigadora y se mudó a Barcelona, un epicentro a nivel europeo de investigación. Pero, vaya, eso fue la escusa, hubiera acabado viniendo aquí igualmente. La crisis está siendo dura para todos, pero se nota menos en las grandes ciudades, especialmente si te dedicas a la fotografía: siempre requieres dinamismo a tu alrededor. ¿Qué tal el dinamismo de la Calle de la Paloma? Muy bien. El tipo de proyecto que he empezado (lo inauguré hace dos meses) requiere estar a pie de calle, cerca de la gente. Para mi el Raval es como un bastión de resistencia frente a esta Barcelona postolímpica que está en todas partes. Dentro de la gentrificación que Ciutat Vella está viviendo, me gusta mucho cómo aquí se sigue conservando aquella parte más auténtica. Es posible que el Raval también acabe gentrificándose, de hecho ya está en ese proceso y no puedo negar que es posible que me acabe beneficiando a mi. Sin embargo, de momento, disfruto del hecho de que quizás es de los barrios de Barcelona que se parezcan más a su época original. Y esto conecta con el espíritu de Sr. Archer. Justo. Aunque yo siempre digo que no quiero convertirme en un parque temático con decorados de árboles donde los turistas vengan a retratarse aquí disfrazados de Gaudí. Si alguien quiere hacer eso, bienvenido sea. Pero no me interesa enfocarme en este camino porque aquí la tradición y el presente están muy conectados, ¡pero no debemos olvidarnos del presente! Mi mirada es contemporánea y también lo es la actitud hacia el hecho de ser retratado de los que vienen a hacerse fotos, no pude ser de otra manera. Hace un siglo y medio retratarse era todo un acontecimiento y ahora se ha convertido en algo sumamente cotidiano. Otro motivo por el que me instalé en el Raval es porque aquí encontré el local perfecto: los techos altos permiten instalar las luces y un altillo con espacio para el despacho, mis vinilos, etc. Y, lo más importante de todo: el espacio para el laboratorio con la pica que creo que es original. Me gusta que la gente pueda estar allí conmigo en el momento en que su imagen aparece en la placa. Corroboro que es una experiencia única. ¿Qué te llevó a interesarte por la técnica del colodión? 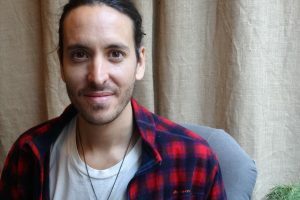 Siempre me había interesado esa técnica, cuando llegué a Barcelona empecé a trabajar mucho, primero para la revista Jot Down y a raíz de eso, en otros medios. Tuve mucha suerte. Pero trabajando tanto, me di cuenta de que después de una sesión de 500 fotos, quizás se publican 2 o 3 y las otras se quedaban en el archivo. Paralelamente a esto, mi atracción por el colodión creció como una reacción a la rapidez de lo digital donde haces 10 fotos por segundo. Con el colodión necesitas un mínimo de 10 minutos para una sola foto. Este concepto genera mucho interés incluso en gente que normalmente no está interesada en el mundo de la imagen. Esto es un negocio, pero también un punto de encuentro entre diferentes personas o fotógrafos que quieran descubrir una forma distinta de crear imágenes de la que hoy usa la mayoría de la gente. También es una vuelta a los orígenes de la fotografía. 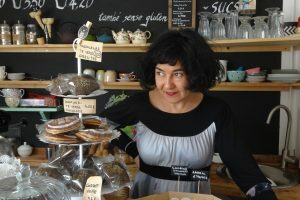 Los productos químicos que se usan para crear cada fotografía están basados en recetas de hace 150 años, no hay mucho espacio para la innovación, pero es muy bonito el hecho de ser tú mismo quién mezcla los productos y, desde allí, siempre le puedes dar tu toque personal tanto a la mezcla como al proceso. Irónicamente, los límites de esta técnica resultan liberadores. Una última pregunta Alberto, ¿quién es el Señor Archer? Fa uns dies vaig passar per una botiga de Barcelona que em va cridar l’atenció i, quan vaig fer-li una foto amb el mòbil, el dependent em va comentar: «si la puges a Instagram, no facis servir cap d’aquests filtres “viejunos”, si us plau». Filtres «viejunos». 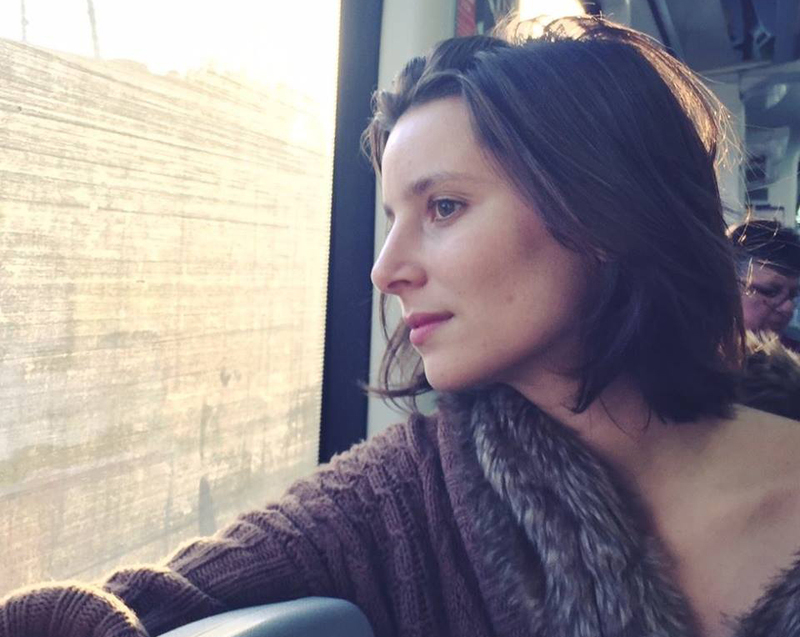 Crec que aquest és un dels secrets que fan que Instagram s’hagi popularitzat tant: quan manipulem una foto feta el 2014 i fem que sembli dels anys vuitanta, li lliurem (en aparença) el temps i la perspectiva que li manquen. Així és com en major o menor mesura creem, en temps real, la nostra pròpia llegenda. Però, què passa si una foto feta el 2014 té una textura i una aparença idèntica a les primeres instantànies que es van fer durant el XIX? Visito el fotògraf Alberto Gamazo (Gijón, 1981), propietari del recentment inaugurat Señor Archer: un establiment situat al carrer de la Paloma, al Raval. Els seus clients es poden retratar mitjançant l’ús de la tècnica del col·lodió, la mateixa amb què es van retratar alguns dels nostres avantpassats —els que van poder tenir aquesta oportunitat. Seria massa aventurat imaginar que el fet retrocedir més d’un segle, pel que fa a l’aspecte dels nostres retrats, pot ajudar a crear la nostra història, però el que sí que és clar és que l’experiència ens apropa als nostres rebesavis i això, almenys per a mi, resulta molt emocional. D’altra banda, també és possible que el resultat d’aquesta sessió arribi a confondre, algun dia, els nostres descendents. Aquesta idea no deixa de ser divertida. La recerca de la perfecció en aquest mitjà no és el primordial. De fet, abracem la imperfecció sempre que sigui estètica, i no el producte de la desídia o de la deixadesa. Els que ens dediquem a això acceptem que hi ha coses que no pots controlar. Les bases sempre han de ser estables, però també hem de deixar espai per a l’atzar i la sorpresa. Això ha de ser una de les parts més atractives del procés. Sí. Una altra de les màgies de la fotografia és que està influïda per tot el que t’envolta: les pel·lícules que veus, els discursos que escoltes, etc. Cada fotògraf acaba desenvolupant una mirada molt personal fruit de la tècnica i de la pràctica, però també d’alguna cosa innata: si demanes a cent fotògrafs que et facin la mateixa foto, tindràs cent fotos diferents. Això em fascina. Vas arribar a Barcelona fa tres anys. Què et va portar aquí? Vaig venir aquí amb la meva xicota que és investigadora i es va mudar a Barcelona, un epicentre en l’àmbit europeu de recerca. Però, vaja, això va ser l’excusa, hauria acabat venint aquí igualment. 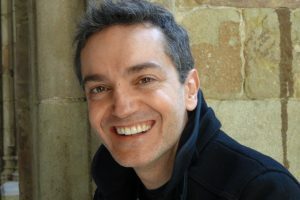 La crisi està sent dura per a tothom, però es nota menys en les grans ciutats, especialment si et dediques a la fotografia: sempre requereixes dinamisme al teu voltant. Què tal el dinamisme del carrer de la Paloma? Molt bé. El tipus de projecte que he començat, que el vaig inaugurar ara fa dos mesos, necessita estar a peu de carrer, a prop de la gent. Per mi el Raval és com un bastió de resistència enfront d’aquesta Barcelona postolímpica que ja és a tot arreu. Dins el procés de gentrificació que Ciutat Vella està vivint, m’agrada molt com aquí se segueix conservant aquella part més autèntica. 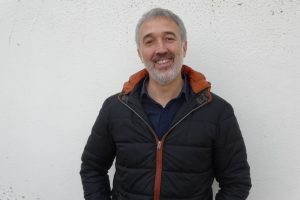 És possible que el Raval també acabi com el Born, per exemple, de fet ja està en aquest procés, i no puc negar que és possible que això també m’acabi beneficiant al mi. No obstant això, de moment, gaudeixo del fet que potser, aquest és dels barris de Barcelona que s’assemblen més a la seva època original. I això connecta amb l’esperit de Señor Archer. Just. Encara que jo sempre dic que no vull convertir-me en un parc temàtic amb decorats d’arbres on els turistes vinguin a retratar-s’hi aquí disfressats de Gaudí. Si algú vol fer això, benvingut sigui. Però no m’interessa enfocar-me cap a aquest camí perquè aquí la tradició i el present estan molt connectats, però no ens hem d’oblidar del present! La meva mirada és contemporània i també ho és l’actitud cap al fet de ser retratat dels que vénen aquí a fer-se fotos: no pot ser d’una altra manera. Fa un segle i mig retratar-se era tot un esdeveniment, i ara s’ha convertit en una cosa summament quotidiana. Un altre motiu pel qual em vaig instal·lar al Raval és perquè aquí vaig trobar el local perfecte: els sostres alts permeten instal·lar les llums i un altell amb espai per al despatx, els meus vinils, etc. I, el més important de tot: l’espai per al laboratori amb la pica, que crec que és original. M’agrada que la gent pugui estar amb mi en el moment en què la seva imatge apareix a la placa. Corroboro que viure el procés és una experiència única, especialment aquest moment en què la imatge sorgeix a la placa. Què et va portar a interessar-te per la tècnica del col·lodió? Sempre m’havia interessat aquesta tècnica. Quan vaig arribar a Barcelona vaig començar a treballar molt, primer per a la revista Jot Down i arran d’això, en altres mitjans. Vaig tenir molta sort. Però, treballant tant, em vaig adonar que després d’una sessió de cinc-centes fotos, potser se’n publicaven dues o tres i les altres es quedaven a l’arxiu. Paral·lelament a això, la meva atracció pel col·lodió va créixer com una reacció a la rapidesa del digital, en què fas deu fotos per segon. Amb el col·lodió necessites un mínim de deu minuts per a una sola foto. Aquest concepte genera molt interès fins i tot en gent que normalment no està interessada en el món de la imatge. 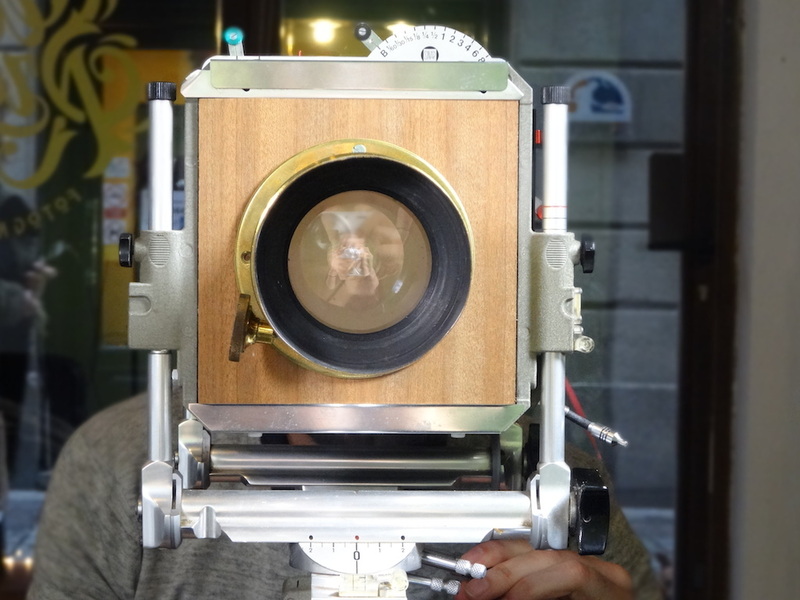 Això és un negoci, però també un punt de trobada entre diverses persones o fotògrafs que vulguin descobrir una manera diferent de crear imatges de la que avui fa servir la majoria de la gent. També és una tornada als orígens de la fotografia. 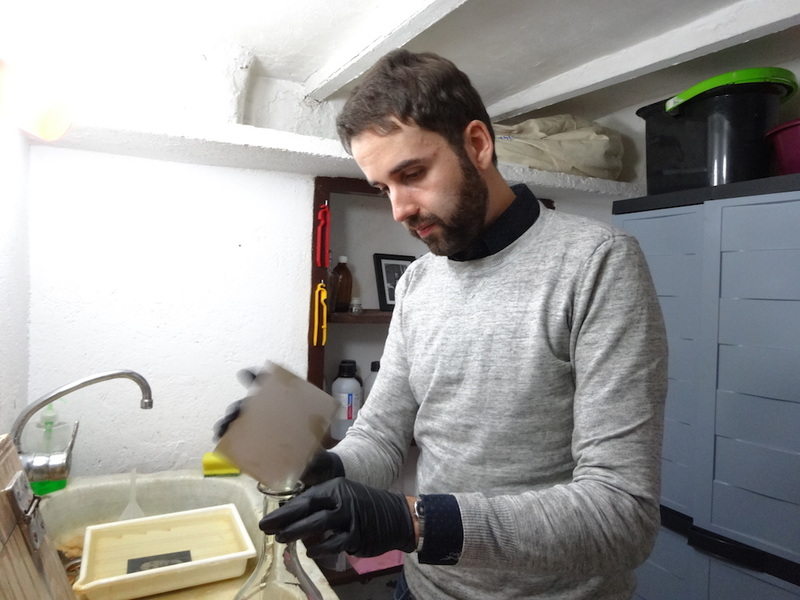 Els productes químics que s’usen per crear cada fotografia estan basats en receptes de fa cent-cinquanta anys, no hi ha gaire espai per a la innovació, però és molt bonic el fet de ser tu mateix qui barreja els productes i, des d’allà, sempre li pots donar el teu toc personal tant a la barreja com al procés. Irònicament, els límits d’aquesta tècnica són alliberadors. Una darrera pregunta, Alberto. Qui és el senyor Archer? He posat aquest nom al projecte per reivindicar i homenatjar la figura de l’anglès Frederick Archer (1813-1857), conegut per haver inventat el col·lodió, encara que aquesta invenció també se sol atribuir a d’altres. Ell no va patentar els seus invents i va morir en la misèria.